Grade I strain. 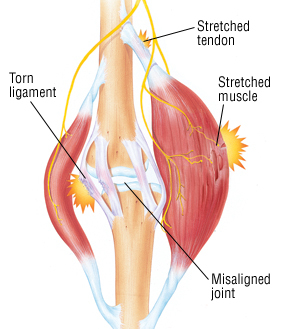 In this mild strain, only a few muscle fibers are stretched or torn. Although the injured muscle is tender and painful, it has normal strength. Grade II strain. This is a moderate strain, with a greater number of injured fibers and more severe muscle pain and tenderness. There is also mild swelling, noticeable loss of strength and sometimes a bruise. Grade III strain. This strain tears the muscle all the way through, sometimes causing a "pop" sensation as the muscle rips into two separate pieces or shears away from its tendon. Grade III strains are serious injuries that cause complete loss of muscle function, as well as considerable pain, swelling, tenderness and discoloration. Because Grade III strains usually cause a sharp break in the normal outline of the muscle, there may be an obvious "dent" or "gap" under the skin where the ripped pieces of muscle have come apart. Although the risk of muscle strain is especially high during sports activities, you also can strain a muscle by lifting a heavy carton or by simply stepping off a curb.